First of all, I’m talking about a restaurant, and not the recently-concluded Fox Reality show. But more on that later. So that was enough to interest me. So during our last day on our Minneapolis trip, we went downtown to Hell’s Kitchen for breakfast. And I’m rather glad we did. I had a pancake and toast, and Carol had a bowl of wild rice porridge (how Minnesotan…). The pancake was just your basic pancake, but perfectly executed: nice fluffy but not chewy batter, nicely crisped, with maple syrup (oh, how living in Northern New England quickly turns you into a syrup snob). 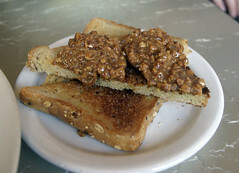 The toast was nice and hearty, served with a giant jar of peanut butter (along with some marmalade and preserves). And that’s where the action was. This *was* some seriously good peanut butter, nice and crunchy, and honey sweetened. We polished off the whole jar ourselves, and bought some to go. So, I had a very good breakfast there. I’ll have to try them for another meal my next trip. 1. The peanut butter is definitely “boss.” So, my overall recommendation is “Try the peanut butter.” The rest of the breakfast menu appeared quite solid, and both the porridge and the pancake I had were top-notch. 2. The ambiance is also quite nice. They took the Hell motif and ran with it, without getting excessively tacky. 3. Affordable. This was one of our cheapest meals (around $12 for both of us), which wasn’t bad considering we both ate about half a pound of peanut butter. 1. The name. I hate to say it, but Hell’s Kitchen is about the least imaginative name you can come up with for a restaurant. It’s a New York neighborhood. It’s a Gordon Ramsay reality TV show. It’s a nightclub in Tacoma. It’s a bad movie. It’s a song. It’s a novel. It’s…. very overused. 2. It’s downtown. If you don’t go early, expect slight parking headaches. Anyways, despite my loathing of the name, I do actually recommend it. next time you’re in Mpls you have to try the weekend breakfasts at the Triple Rock. Amazing, but that’s just me.